After snaking around for most part of the day, travelling from Jageshwar in search of that coveted mysterious limestone cave temple, we were about to reach the place from where we would have got a chance to go under the earth. 14 km from Gangolihat in the Pithoragarh district of Uttarakhand is the mysterious place known as Patal Bhuvaneshwar, (पाताल भुवनेश्वर). The meaning of “Patal” is place under the earth. Small walk of 5 minutes and we were at the entrance of this cave, which is 160 m long and 90 feet deep from the point of entrance. But we had to wait as entry to the cave is permitted only in batches along with a dedicated guide. Those suffering from high Blood Pressure and breathing problems (Asthma) are advised not to go down. 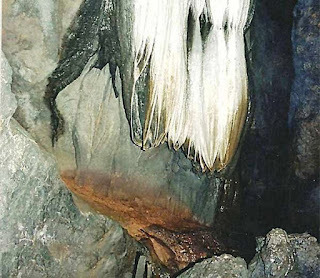 World of Caves at Patal Bhuvaneshwar is an encyclopaedia into our mythology and has reference to various Eras of time, Sagar Manthan (Ocean churning), Lord Ganesh beheading, Pandavas, River Ganga in Lord Shiva’s hairs and many more. 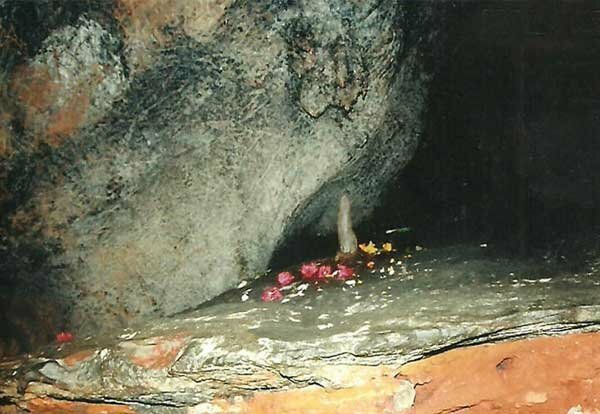 Reference about this cave is found in ‘Manaskhand’ and ‘Skandpuran’ whose 800 verses tells about Patal Bhuvneshwar. 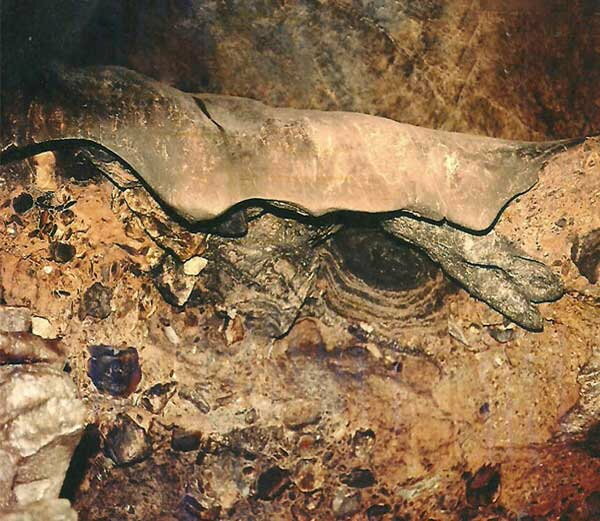 Cave is spread upto 160 kms long, however exploration is allowed only till a small distance. Cave is all natural, not constructed or carved by any human. From the entrance we were seeing that this cave has a narrow tunnel-like opening, however this leads to a number of caves. We have to get down 90 feet on some very steep and slippery stairs. I got some tremendous workout, by holding on just to a chain in one hand and carrying my 4-year-old kid in other hand. 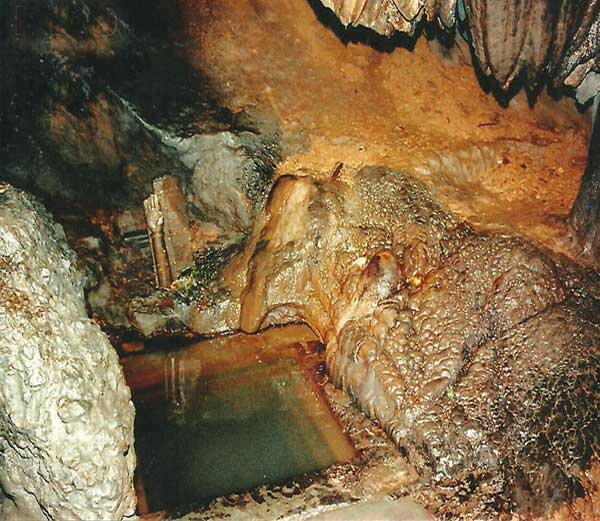 Built by the flow of water, Patal Bhuvaneshwar is not just one cave, rather a series of caves within caves. At some point we have to just lie down flat to get down inside the cave. Stairs’ stones have got some natural carvings as well. You need not fear the darkness as the cave is fully electrically illuminated. Photography is strictly prohibited and cameras, mobile phones have to be deposited outside the cave. The below pictures were clicked from one of the outside shops, selling the pictures of this legendary cave. 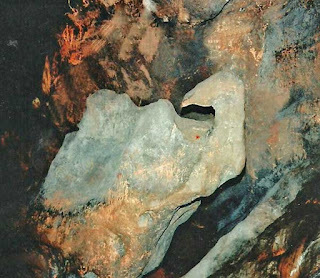 As soon as we enter the cave, the first formation visible on our left hand side is stone carving of Sheshnaag (King of All Serpents) holding the earth on his head. Few steps ahead, is a small havankund (small enclosure to perform rituals), where once a havan (ritual) was performed by the gods to burn all the snakes. It is believed that one snake hid inside the fruit to save his life we can see the snake like carving on the wall of the cave. Moving forward we came across a structure, resembling the lower part of the body below the head of a human. It is believed that at this place the head of Lord Ganesh was cut by his father Lord Shiva. Furious by this act of Lord Shiva, Goddess Parvati took a terrifying form (avatar). Scared by this Lord Brahma put a flower on top of the lower body of the Ganesha, nectar was flowing out from this flower to preserve the body of Ganesh for the time Gods arranged to replace the head with head of Elephant. That is how Lord Ganesh came in the form of Elephant God. The nectar dripping down from the petal of the flower would have preserve this head for ever. The place where devotees worship Lord Shiva. 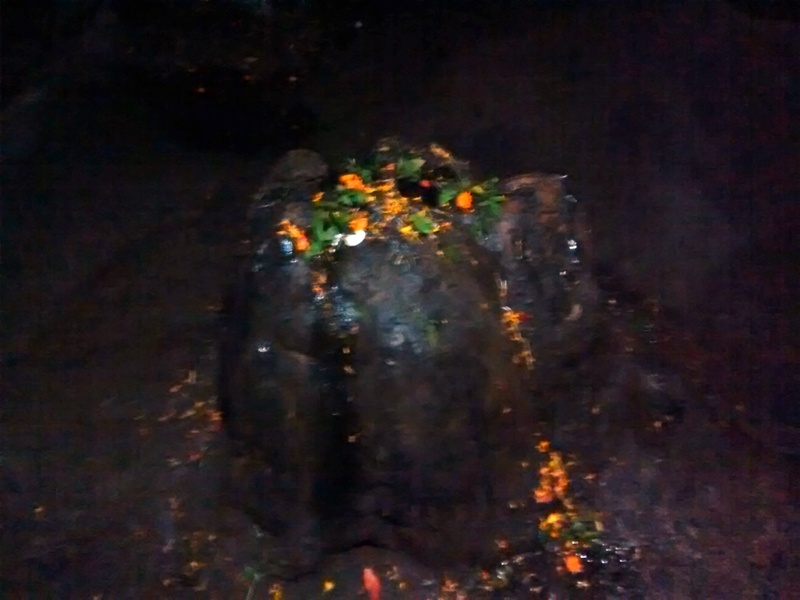 This Shivalinga was placed here by Shankaracharya. Suddenly we came across a stream with many pebbles in it. Those pebbles were giving an impression of many people standing in an assembly. The guide revered them as thirty-three Koti (type) devi-devta of Hinduism. Practically with in these 33 types referred to as Gods, all the forms of life existing on Earth are covered. That is why Hinduism lay so special emphasis on preserving and respecting all forms of lives. Our guide then drew our attention towards three Stalagmite formations that looked like three heads. He told that these heads represent the trinity of Hinduism – Brahma, Vishnu and Mahesh. Those three heads had three corresponding Stalactite over them. Out of these three, water was dripping over the heads of Shiva and Vishnu, but had dried over the head of Brahma. Guide explained that once Brahma and Vishnu started argument on which one is greater. Lord Shiva intervened on request from Lord Vishnu and Mahesh and took a form of giant Lingam (Avatar of Lord Shiva). Winner will be the one who will locate the end of this lingam. 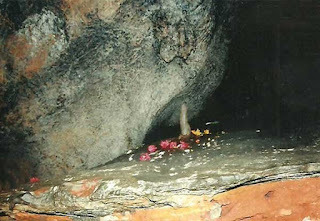 Vishnu soon realised that there is no end to this lingam and indeed Lord Shiva is the greatest. However, Brahma decided to lie to Lord Shiva and asked flower Ketaki to testify in his support. This lie turned fatal to Brahma, as infuriated Shiva cut his fifth head (which lied) and also cursed Brahma for not to be worshipped by anyone. So Brahma lost his devotees and the falling water had dried over Brahma’s head. Perhaps this is the reason why Lord Brahma, despite being hailed as creator of Earth is not worshipped like Lord Shiva and Vishnu. Also flower Ketaki was cursed that it will not be used in any ritual henceforth. Though Ketaki flower (known as Screw Pine) is highly fragrant and is used for preparation of perfumes and fragrant Oils. We saw a small tunnel like opening was there which looked like open mouth of a dog and drops of water were drippling down from the tongue. The guide told us the story about it is that if someone goes inside his mouth and travel till the tail, will attain Moksh. Moving ahead further inside the caves, we saw 4 doors type structures out of which 3 were closed and one was open for walking through. Guide informed that the 4 doors are door of sin and crime, the door of war, the door of righteousness, and the door of duty (पाप द्वार, युध द्वार, धर्म द्वार और कर्तव्य द्वार). These doors associated with important events in the past were open in the beginning - door of sin and crime (पाप द्वार) closed after the death of Ravana, door of war (युध द्वार) was closed after battle of Mahabharata and the door of righteousness (धर्म द्वार) was closed after Yudhishthir (eldest of the Pandavas) attained nirvana. Today only the door of duty is open, highlighting the fact that humans should only focus towards righteous duty in this age. To convince us about the closed doors, the guide flashed his torch in the directions of closed doors and we were able to see closed paths, which looked like closed with time with landslides. And there is also a Crane, face of which was pointing to the other side. Once the legendary Swan was assigned duty to keep a watch over the heavenly nectar pond. However, the Swan got greedy and decided to drink the nectar. Furious Gods cursed the Swan with neck turned to another side. Every step here was unravelling our rich and resourceful mythology. In one corner we noticed a stream of water and some white impression looking like the Jatas (rolled hairs) of a yogi. This time the connection was about coming of river Ganga on Earth. King Bhagirath who pleased Goddess Ganga (River Ganga is considered as river from heaven) to come on earth and liberate his ancestors who were cursed by the fury of sage Kapil. However, Goddess Ganga told that Earth is incapable to hold the weight of her descent on Earth. So King Bhagirath prayed and requested Lord Shiva. Lord Shiva agreed to hold the descent of Ganga from heaven in his hairs and allowed to flow thereafter. That is why river Ganga is also known as Bhagirathi. My goodness, what this trip is turning out to be. The Jatas like structure actually are the Jatas of Lord Shiva, below which there is a kund (small enclosure for water) filled with that Ganga water and was made by Vishvakarma. As told by the guide no one knows the end point of his kund. Moving forward the guide drew our attention towards a stone which was growing up vertically from bottom. This stone represents the present time era of Kalyug, it is said that once the stone will grow upto the top it will be the end of this world. Guide pointed towards the dark corner of the cave and said this is the place where the Pandavas stayed while enroute to the heaven. While coming out the guide told about Kalpwriksh, Kaamdhenu (the sacred cow) and Airawat (the mighty white elephant that carries Indra, the lord of rains), treasures from churning of ocean. And showed stone formation resembling the Kalpwriksh, udders of Kaamdhenu and legs of Airawat. This was the end of our exploration of this amazing place and the journey we covered on our bare feet or on our knees. A journey which as per the mythology gives significance equivalent to Badrinath, Kedarnath and Amarnth travel. PS - Photography is strictly prohibited and cameras, mobile phones have to be deposited outside the cave. The above pictures were clicked from one of the outside shops, selling the pictures of this legendary cave..